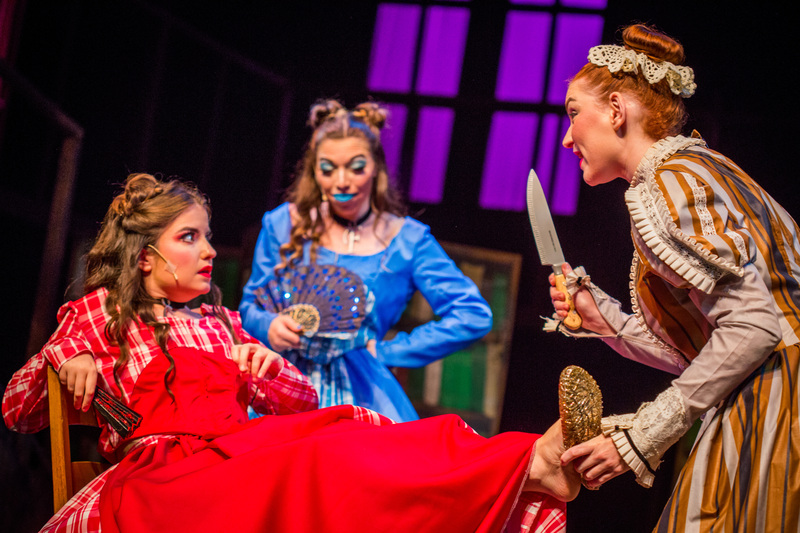 Community Theatre Review: Go INTO THE WOODS for one weekend only! Last night, Director Daniel K. Williams (also a Philly Life & Culture contributor) invited some press to the final dress rehearsal of Bravo Theatre Company’s Into the Woods which opens this evening in West Chester. One of the more highly produced Stephen Sondheim musicals (book by James Lapine) especially since the release of the film version in 2014. It’s rare that a regular theatre goer hasn’t attended a production a time or two. If you haven’t, the story-line itself is smart and captivating and will make you look at your favorite childhood fairytales in an entirely new way. However, this is NO fairytale! Community theatre is understood to be a place for social development. Not only for the participants involved in making the piece, but also for the audience who attends. Bravo Theatre Company fills void in the very artistically professional community of West Chester. They have created an environment where amateurs can gather and take some of their hidden skills of singing and acting and put them on display. After seeing last night’s final dress rehearsal, I was intrigued to learn more about Bravo. I pondered on this mission all day, trying to muster how to again write a “review” for community theatre. I still do not feel community theatres volunteers sign up for criticism, but when a director seeks to continue his/her own “life-long learning” I feel pride that I can contribute a few sentiments. Here’s some hits and misses from last night’s final dress. Christopher Eklund’s (also a Philly Life & Culture contributor) performance as Jack from Jack and the Beanstalk. It is clear he is no “amateur”. There are some roles that people are “meant to play” and this one felt like it was written for his skill set. Greg Hedler as Rapunzel’s Prince gave a stellar musical comedy performance. He really grasped the material and delivered it a way that was unmatched by his peers. Many of the characters re written larger than life and he absolutely delivered. The vocals of Sawyer McLeod who played the coveted role of The Baker was exceptional. He sounded a lot like Chip Zien but with his own flare. The colorful and elaborate costumes by Kristen Mitchell were well constructed. The costumes worn by Cinderella (Susan Guyer) were of note: the bedazzled “C” on her Act 1 dress was exquisite. She wears a spectacular crown in Act II that any Disney princess would swoon over. The scenic design by Daniel K. Williams was clever and well-constructed. The opening scene begins in a library that is utilized as the interior of the story. Moveable bookcases were used to create trees in “the woods” and a staircase to the top of the library was used for Rapunzel’s tower to name a couple. The sound effects as designed by Christopher Koles were a welcome to this scaled down production that helped heighten the magic of the storyline. However, the Giant’s voice could have been more powerful and ominous. The staging in the Act II finale by Susan Guyer was a highlight. I wish there was more of it throughout and it gave you the musical theatre kick. Although the concept of being in a library was clever, I am sorry to say that it didn’t really play. The story still comes through on its own and is effective, but the inner-mechanics were a little muddy. For example, some props used were literal and others were abstract. The modern-day costumes in the first scene were a hit, but then everyone changed into “standard” fairytale garb when it would have been extremely successful to stick to modern day concept while adding a costume piece or two. Lighting: Missed cues aside as they have a full day to correct before opening tonight, the biggest miss was that the lights weren’t being used to aid the story. Gobos of trees were creating shadows on faces making it difficult to watch the expressions of the actors. Most community theatres do not have the instruments to create decent lighting, however this facility (Madeleine Wing Adler Theater at West Chester University) was chock full of instruments. As mentioned earlier with the moveable bookcases, the scene changes were fully lit whereas it would have benefitted the transitions in the tempo of the show to use scene change lights or blackouts. The orchestra was of professional caliber, however they sounded extremely far away. With such a rich score, they should be leading players. I also missed the sound of a harp. The conductor is not listed separately in the program, so I would assume Musical Director Sarah Jane Gober was at the helm. Although very funny scene with snappers popping on the ground as magic beans, “I wish” there was more magic. There are some innovative concepts but needed a small army to really put it over the top. I was reminded the other night by some ladies I just met, that my take on theatre is much different that the average community theatre goer. I wish my readers to keep that in mind. I enjoyed this production very much. Even with some missed tempos and wonky notes, that’s what gives community theatre it’s charm. As its ambitious for any amatuer theatre to produce Sondheim I was pleasantly surprised how well Williams and his team pulled it off. I encourage all theatre-goers to patronize Bravo Theatre Company as they are in the upper-echelon in community theatre with great talent and production value having just a couple years under their belt. The creative team has gathered artists from all over Delaware and Chester counties and proudly puts their hard work on display. Into the Woods plays for a ONE WEEKEND ONLY in a beautiful theatre with some darn comfortable seats and PLENTY of free parking! Bravo Theatre Company engages, entertains, challenges, and uplifts audiences with theatrical productions that range from the classics to new works. We are committed to developing a theatre community which provides arts education programs that promote life-long learning, creates performance and backstage opportunities for all ages, ensures that live theatre is accessible to everyone regardless of income, and celebrates the power of theatre to illuminate our common humanity. Bravo Theatre Company is a non-profit 501(c)(3) organization.